Last pics from Opie's: Russell for Heisman!!! 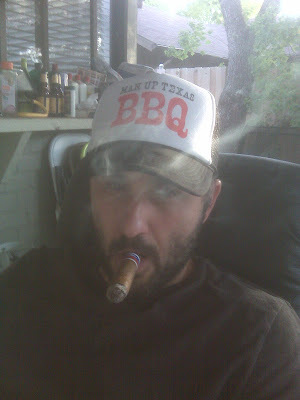 Brad's Man-Up trucker's hat arrived today, so he's sporting it, taking our post-dinner cigar smoking to a new and oh-so-healthy level. Oh, and speaking of dinner, Brad and 4 others hit up City Market in Luling and Smitty's and Kreuz in Lockhart tonight. You heard me right: 3 premier Texas BBQ joints in one evening. Talk about manning up. I don't even know what to say right now. Reviews and pics to follow. New Book: "Republic of Barbecue: Stories Beyond the Brisket"
Read about the book and the project that led to it. After a few of us took a dip in Hamilton Pool, 12 of us manned up at Opie’s Barbecue, a Man-Up favorite in Spicewood. 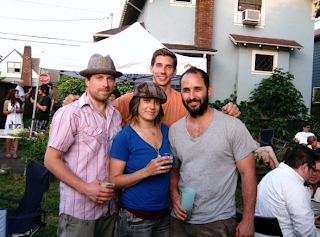 We were fortunate enough to have co-owner Todd Ashmore hang out with us during the meal. The food and the service from the entire staff were fantastic, as always. No surprise, the sweet-and-spicy ribs (my favorite Texas BBQ order) were great; but the biggest hit of the day for me was the pulled-pork shoulder. Outstanding. 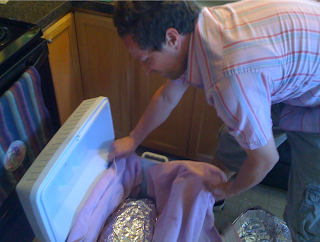 I got the first pull from it, and it was what can only be described as hot, salty, flavorful perfection. Great pulled pork in Texas? WHAT?!?!?!?!?! Anyway, several reviews to get to, with first-time reviewers Travis and Matt leading off. The first of many spotlights of official Man-Up merchandise is on our basic t-shirt. Check out the t-shirt's page on Zazzle, play around with color schemes to find what you like the most, and take the plunge! All the cool kids are doing it. (long pause) You wanna be cool, right? 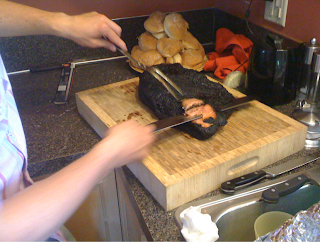 Yesterday, while I was en route to Chicago, Man Up made the trip to Taylor for lunch at Louie Mueller Barbecue, the big winner in our Best of 2008 Awards. Review, scores, and pics to follow; but, in the meantime, check this out: Louie Mueller Barbecue named by USA Today as one of the "10 great places to eat regionally, eat well." Congrats, LMB!!! Free music, Rudy's BBQ, and more at Music Under the Star. At the Bob Bullock Museum in downtown Austin around 6:15. Free museum admission from 6-9 pm, and free event parking in the Museum's underground garage on the corner of 18th St. and Congress Ave.
Man-Up products for sale on Zazzle!!! You've been patient, and now it's time for your reward. 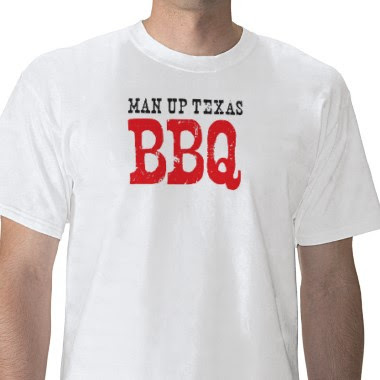 Man Up gear available for purchase on Zazzle!!! More products on the way. See the bottom of the blog for a peak at what's for sale!!! 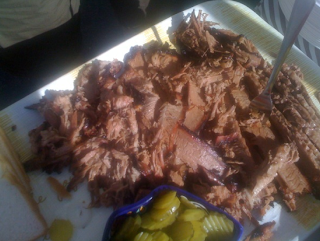 I've created a Texas BBQ group on Ning.com. Join, and help develop the group! We’d been hearing for quite some time that we needed to hit up Sam’s BBQ in East Austin. It’s close to downtown, we’d heard nothing but glowing reviews, and it got good marks from Fearless Critic; so, on a sweltering Thursday night, 12 of us made the short trip down East 12th Street to Sam’s, a decades-old Austin institution. A friendly mother-and-son-run joint in an old white house, Sam’s definitely has character. Brian, who single handedly manned all of the food cutting and serving, was kind enough to show us the kitchen/pit and answer all of our questions. The pictures on the walls walk you through years of Sam’s history and can keep you intrigued and entertained for as long as it takes your meal to be ready, by which time you should be sweating from the lack of air conditioning in cramped quarters. Based on our experience, however, the walls of the restaurant might be the highlight of your visit. The food was a consensus disappointment. 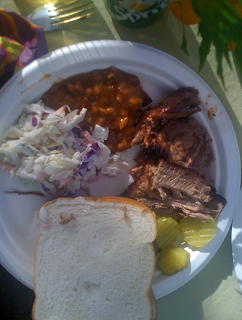 The brisket was decent enough, but the pork ribs were very tough, and the beans were downright dreadful. The best I could do was basically gnaw on the ribs; and, as three of us pointed out independently of one another, the beans actually had negative taste. They were out of chicken, my first choice. I didn’t care for the house special: mutton. Granted, BBQ joints can have a great day one day and be terrible the next. And on the same visit, one person might leave wowed and another might leave nauseated. Tastes vary. It’s quite subjective. But, for the life of me, I cannot figure out how Sam’s food was rated a 9 by Fearless Critic (out of 29 restaurants rated, one of only 8 whose food got a 9 or above). Maybe we just hit them on an off night. Maybe rave reviewers have just bought into the hype. Or maybe we just don’t know what we’re talking about. Regardless, I think it’s safe to say Man Up won’t be making the short drive down East 12th anytime soon. 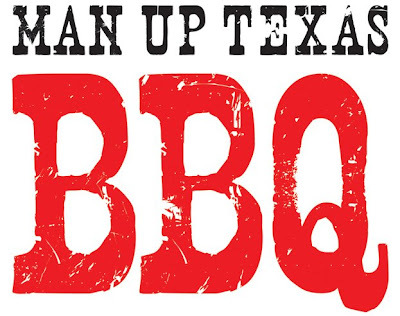 *Man-Up logo created by our very own Brad Istre, of Sidedoor Studio. 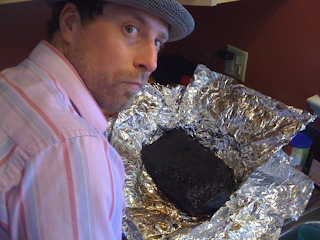 Texas BBQ in Portland, Oregon? 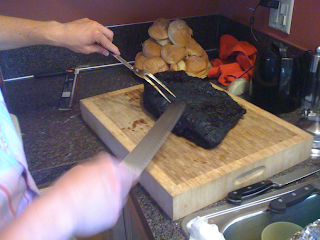 You bet your brisket!!! Bright (and already blazing hot) and early tomorrow morning, we're heading to Hamilton Pool and then lunch at Opie's in Spicewood. Check "Events" on our Facebook group page for details, if you want to join. Man Up has joined Twitter! 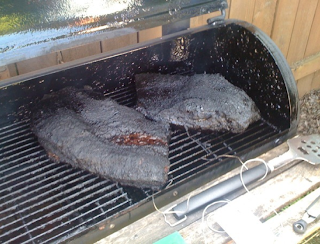 QOTD: Is jerky more Texan than BBQ? Going vegan for 3 weeks??? Jason converts another to our noble cause. Facebook group page is on fire. 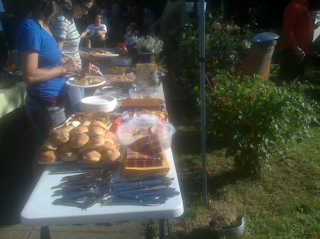 QOTD: Anyone have BBQ plans for the 4th? 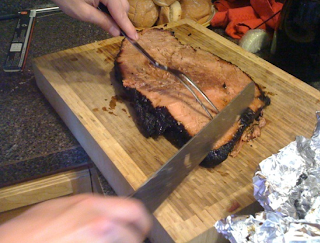 QOTD: Fatty or lean brisket? More from RP & Co.